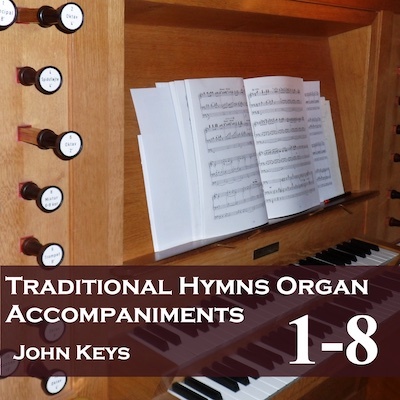 A superb value set of hymn accompaniments on CD - 138 popular Traditional Hymns from Ancient & Modern New Standard (scroll down for full list of hymns) as the Core Set, or add another 48 hymns, taking the total up to 186 to make Core Set Plus. You can add to this set with season and church specific or worship song albums, like the Catholic albums, Methodist albums, Christmas albums, Remembrance album and so on - but the Core Set provides the most widely used traditional hymns. Note that not every church uses the same tune for a particular hymn. Please check the track lists, which include the names of the tunes used. We also have the option of adding an extra album of alternative US tunes where the UK tune is not so often used in the US. There are no voices on these recordings, just a playover and the accompaniment. The MP3 set is compact and cost effective: it is the most flexible way to play your accompaniments. Once the files are in place on a computer or iPod/MP3 player you can search for an accompaniment by the name of the song. Particularly useful is the ability to set up a playlist for a particular service or event, putting the tracks you need on the day at your fingertips. Our MP3s to download or on disc/memory stick come as standard at 256 Kbps, the usual bit rate for MP3s. The Core Set Plus at 256 kbps takes up around 1.1 Gb. If you are using an old iPod or phone with limited storage, you can opt for our compact version - just drop us an email at info@cul.co.uk when you've placed your order. The compact files are at 128 Kbps - the sound quality isn't quite as good, but it only takes up half the space. To hear how the MP3s sound, you can download some free complete MP3s (256 Kbps) to try on your sound system by clicking here, or if you need to check the difference between the normal MP3s and the compact files download a set of samples at different bit rates by clicking here.